Timewell Drainage Products is proud to announce that Darren Wagner has assumed the role of Chief Executive Officer effective October 1st. 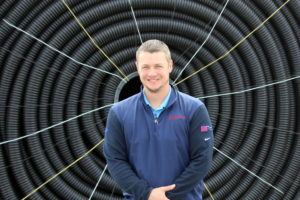 The move places Wagner in charge of all operations for our HDPE corrugated pipe manufacturing. Don Colclasure is now Chairman of the Board. “I’m honored to have been entrusted with this position, and I’m excited about the opportunity we have to lead the farm drainage rush going on in our industry right now,” Wagner said. Husband and wife team Don and Susan Colclasure started Timewell’s parent company, C&L Tiling, in 1982. Over the last 36 years, the company has grown into an industry leading a tile manufacturer with 7 locations in the Midwest and South. Timewell was built to serve a drainage contractor. Understanding the needs of a drainage contractor has helped us develop a service level that’s arguably the best in the industry. The original drainage contracting company still provides tiling service in select Midwestern states. We are still family owned today. Wagner has been with Timwell for more than 15 years and has a proven track record of leadership and knowledge of every segment of the business. He has served in various positions including VP of Manufacturing Sales and most recently as President. As CEO, Wagner plans to continue building on recent company expansions to increase market share and drive growth in new markets. “Our background and history is in – and will remain in – agriculture, but I’m looking forward to helping the team expand our presence in the metropolitan storm water market,” said Wagner. Wagner holds a Bachelor’s degree in Business Management from William Penn University and lives in Mt. Sterling with his wife and children. Wagner is very optimistic about the future of Timewell. “Keep an eye on us. I think the farming industry is going to see some exciting announcements coming up,” he said.